Blockout roller blind in Vibe Limestone. Outside mount, back rolled. We pride ourselves on providing the best quality fabrics at the most affordable prices. 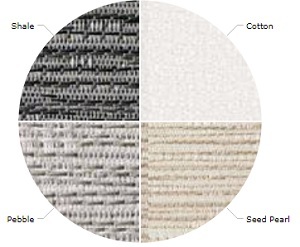 We offer a choice of classic and designer fabrics for your custom made blinds. With over 22 years in the blinds industry, we know what sells. We have done the research and tested the market for you and carefully refined our range with a focus on the best selling fabrics and colours at the most competitive prices. Carefully considered, our fabric ranges offer longevity with mainstay classics, as well as providing choice in line with market trends offering the latest in designer styles and colour palettes. We source from Suppliers who can not only offer a great range of quality, designs and colours but also adhere to strict regulations regarding the manufacturing of fabrics to ensure they are safe for your family. 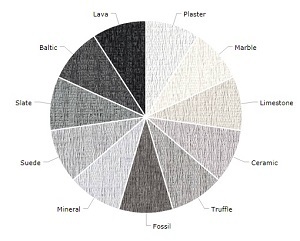 All our fabrics are non-toxic, VOC, heavy metal and formaldehyde free. This means that you can rest assured that our blinds will not cause any skin irritations or breathing difficulties, especially if any of your family members suffer from allergies or asthma. With over 20 + years of experience in the industry, our expertise & success lies in providing high-quality genuine Custom Made Blinds at competitive prices. One of the few remaining authentic blind manufacturers in Australia, we manufacture your blinds right here in Melbourne. No 'ready-mades', 'cut downs' or 'TTS' (Trimmed to Size). 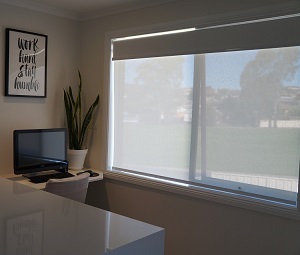 Every blind from iseekblinds.com.au is produced exactly to your requirements. We use only the finest materials to ensure we deliver a product that is well made, long lasting and safe for your family. The most popular roller blind choice, you can ensure the perfect light control with blockout roller blinds. 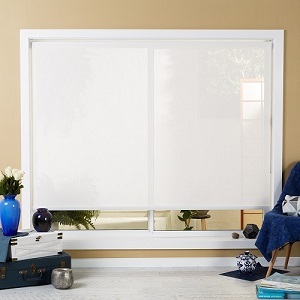 Otherwise referred to as blackout blinds they provide 100% light block and privacy. 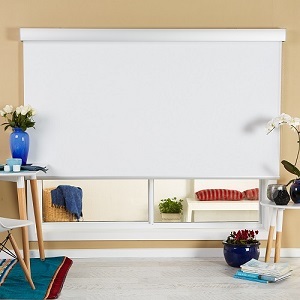 Blockout roller blinds offer both day and night time privacy. Pair with a sunscreen blind to retain your view to the outside during the day. Sunscreen blinds also offer daytime privacy allowing you to retain natural light during the day. 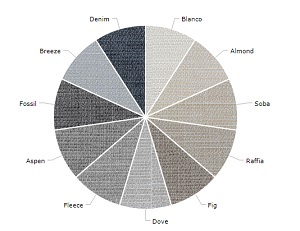 With excellent insulation properties, select a white back or a tonal backed fabric. 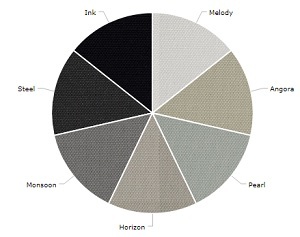 All of our Blockout Roller blinds fabrics offer 100% blockout - the functionality does not differ between the ranges. A popular choice within the iseekblinds portfolio, this fantastic range offers a brilliant choice of colours that are exactly in line with what our customers are looking for. 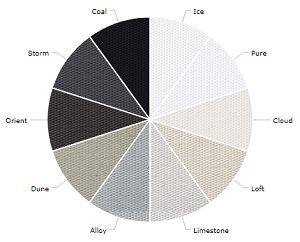 Keeping it simple and easy to understand, ISB Insul Bloc has colour names that make sense! Offering exceptional quality, ISB Insul Bloc has a foamed acrylic backing normally found on fabrics at significantly higher price points. The foamed acrylic backing ensures excellent insulation benefits as well as giving the fabric softness and flexibility. PVC and Lead-free mean you can purchase with confidence for the safety of your family. Delivering exactly what a blockout blind should with 100% blackout, a tonal back and the best prices in town, you'd be mad not to have a look. Order your free samples today! Vibe is 100% blockout and the perfect solution if you are looking for an easy care fabric. The surface of the fabric can be wiped clean with a damp cloth. Great for kids and kitchens. Vibe features a tonal back with a matt finish. Safe for families, Vibe is PVC & lead-free as well as dust & mould resistant. We've have selected the top 10 selling colours in this range to narrow down your search in finding the best colours to suit your interiors. You asked for it - we got it! 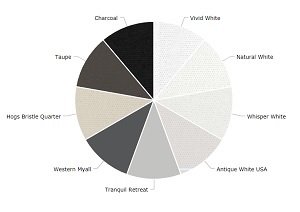 Introducing the Australian made Elegance Dulux range. 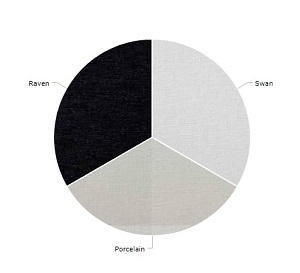 Featuring a plain weave design with a hint of texture, Elegance Dulux is colour matched to the best selling Dulux interior paint colours so now you can easily match fabrics for your walls and windows. Delivering 100% blockout with tonal backing, Elegance Dulux is mould and mildew resistant as well as flame retardant & PVC free. Best yet, Elegance Dulux is an easy-care fabric you can simply wipe clean with a damp cloth. Available for widths up to 2800mm. An iseekblinds favourite with our customers, Mantra features a striking jacquard weave and is available in 6 contemporary colours guaranteed to complement any interior style. With a textured look and feel, Mantra is an affordable designer fabric of excellent quality at a great price. Be sure to check out the newest additions to the range ‘Pebble’ and ‘Shale’ proving the Grey is indeed the ‘new’ neutral. Handy Hint - A 'Jacquard' weave is produced on a special loom and characterised by complex woven-in designs, often with large design repeats or tapestry effects. 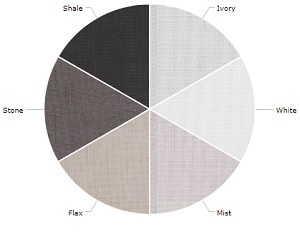 One of Australia's top-selling fabrics, Le Reve has a great contemporary colour palette in line with today's trends. 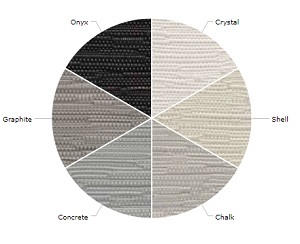 Be sure to look at the new greys - Concrete & Graphite. Sporting a bold and decorative design in a jacquard weave and providing 100% blackout, Le Reve also offers a tonal backing. Skye blockout offers the ultimate solution for those who are looking for a fabric that is not too plain nor too decorative. Adding a new dimension to the jacquard collection, Skye is subtler in appearance than the stronger multi-tonal designs of Mantra and Le Reve, whilst offering a little something more than the ISB Insul Bloc. 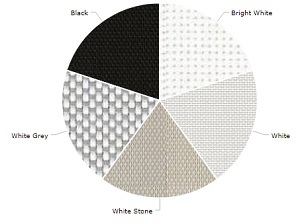 Cherry picking from the colour palette we have selected the bright whites and an inky black which are bound to please. A new addition to the iseekblinds range, Belice features a sophisticated design in a contemporary colour palette. Belice has been woven with a horizontal & vertical textural emphasis to enhance its luxurious visual appeal. The soft tonal hues are sure to complement both the decor and interior colours found in most homes. Fade resistant, with its matching light filter fabrics, you will fall in love with Belice. Greenguard certified makes Belice another safe choice for your family delivering a stunning fabric that is Lead & PVC free, Mould & Mildew resistant, Fire Retardant and easy to wipe clean with a damp cloth. Side note from iseekblinds - On screen Belice and Sanctuary look very similar - however, in real life they look completely different due to their different weave and textural feel. A brand new market release from Shaws of Australia, Linesque delivers a gorgeous linen look appearance. Featuring a new approach to textured fabric, Linesque is bound to complement your interiors with its subtle textural finish in a multitude of colours. Safe for families, this fabric is Lead & PVC free and comes with Green Guard Gold certification, meaning it's accredited for use in sensitive areas such as schools and healthcare facilities - so a fantastic choice for your home. Back by popular demand, Sanctuary will transform and bring your interiors to life. 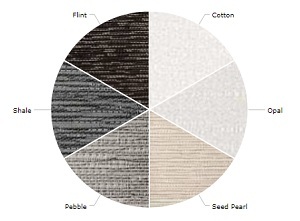 With 11 stunning neutral shades to choose from, Sanctuary’s design has been inspired by the organic textures of nature featuring a jacquard weave which gives a unique 3-dimensional pattern. Fade resistant and designed specifically for harsh Australian conditions, Sanctuary completely blocks out the light. Retain your view to the outside, allow in natural light and at the same time be assured of daytime privacy. Sunscreen blinds excel in controlling the glare entering your room. With an approximate 95% UV blockage they offer protection for your furniture and flooring from sun damage. With energy efficient insulation properties, sunscreen blinds are ideal for keeping your rooms cooler in summer. Pair with a blockout roller blind for nighttime privacy. 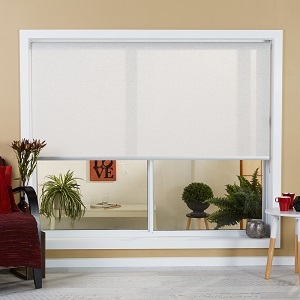 As the hardest working blind in your home, the Sunscreen blind sits closest to your window taking the brunt of the sun's heat. In inferior quality fabrics, the sun's heat can cause the chemicals used in making the fabrics to release poisonous gasses into your home. 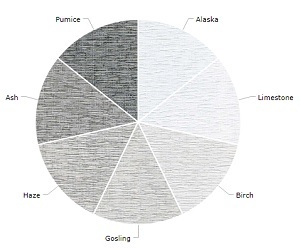 Before you consider purchasing anywhere else, demand to know the credentials of the fabrics they are using to make your blinds. The 'openness' or the weave of the fabric correlates to how much you can see through the sunscreen blind during the day. Retain your view whilst protecting your floor and furnishings from sun damage. We know white is the most popular colour! Bring your views to life with our 10% white sunscreen fabrics offering far more view than weaves of a lesser percentage. And with the addition of our unique offering in Bright White, now you can have it all. Only 5 colours? It's the 80/20 rule. These are the colours that you have told us you want. Making your decision process easier, whilst saving you time and money. This also means we can manufacture your custom made blinds in a faster time frame. Clearview Sunscreen is UV resistant, non-toxic, VOC & formaldehyde free, fire retardant, anti mould & antifungal. An exciting new addition to the iseekblinds range, St Lucia is a fabric of distinction and offers a softer version to the traditional sunscreen. Featuring a contemporary design with a point of difference, St Lucia will deliver an elevated sense of style to your interiors, adding more than the minimalist look of most sunscreens. Serenade is a contemporary translucent blind fabric ideal for modern interiors. Woven with special yarns using the latest technology it has the look of an upmarket fabric rather than an engineered blind fabric. It allows you to take advantage of the view whilst filtering light and protects your prized furnishings and floor coverings. 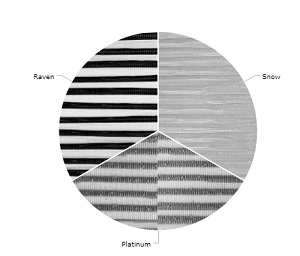 Serenade is available in 3 fashion-forward colours of Platinum, Snow and Raven. The metallic threads combined with the advanced technology of random weaving give it an architectural look and style unmatched by other blind fabrics. Serenade will enhance and update your interiors with its clean and pleasant outlook. Available in an economical width of 2800mm and constructed from stable and durable polyester, Serenade blinds will not only add value and style to your prized investment but will stay looking good for many years. Be the envy of your neighbours and have your translucent blinds made up in this wonderful Serenade. Light Filtering fabrics gently diffuse and soften the light, whilst ensuring both day and night time privacy. Add an extra layer of decorative privacy to a frosted window or hide an ugly view whilst adding warmth and retaining your natural light. 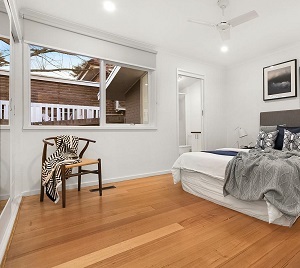 Offering some insulation properties, light filtering blinds are ideal for windows that face the street where you need privacy but don't want to lose your light. The softly diffused light adds a certain ambience to your rooms. The soft tonal hues are sure to complement both the decor and interior colours found in most homes. Fade resistant, with its matching blockout fabrics, you will fall in love with Belice. Day & night privacy, gently filters the light. A perfect match with the Mantra blockout and available in the 4 best selling contemporary colours, Mantra Light Filtering offers a striking jacquard weave guaranteed to complement any interior style. With a tonal back, you can easily streamline your look both inside and out. Mantra Light filtering will give you both day and night privacy whilst gently filtering in natural light. PVC free & fire retardant. Michael's go to for bathrooms with plain or frosted windows. Palm Beach New Collection Light Filter is a plain weave fabric providing decorative light control with day and night privacy. A denser fabric weave ensures greater privacy. Softly filtering light entering your home, Palm Beach features a plain design with subtle distinction. 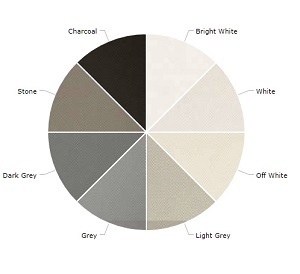 Available in 7 neutral colours, Palm Beach is both PVC & lead-free. Available up to 3000 mm wide. Fabrics should be regularly dusted/vacuumed as appropriate. Surface dust can be removed from the fabric with a duster or soft lint-free cloth or by using the dusting brush nozzle of your vacuum cleaner.